NXT UK finally crowned their queen this week, and with the announcement of the first-ever NXT UK TakeOver PPV in January, it feels like NXT UK is officially becoming an actual brand. No offense, 205 Live. We still need to crown tag team champions, of course, but that's all a matter of time. Seemingly to tease that, another tag team debuted this week while another's implosion came to its end. Plus, a women's tag team match and what seems to be the start of a massive stable feud! Twirl your moustaches, gents! Last week, Joseph Conners betrayed his tag team partner Saxon Huxley after they lost a tag team match to Mark Andrews and Flash Morgan Webster. Conners, whom WWE.com listed as "Connors" because they can't be bothered to do a simple Google check, didn't take too kindly to Huxley's "arrogance" in that match. This week, former tag team partners collided and Conners came out on top with an impressive bunch of power moves. This was a pretty good match, with Conners telling Huxley, “This is my world and you are just visiting.” That was a pretty good line. I thought it was really hilarious when the crowd chanted "Jesus" at Huxley and "Judas" at Conners. That reminded me of that one time Shawn Michaels and "God" faced the McMahons. Good times. Or should I say "God" times? Blasphemy aside, this was unexpectedly the most biblical match to come out of the WWE in recent memory. The story behind Conners and Huxley throwing fists was great. Who says NXT UK doesn't do storylines and just throws people in the ring for a top-notch quality match? Bloody ridiculous. NXT UK can do both top-notch quality matches and logical storylines. Bug off. 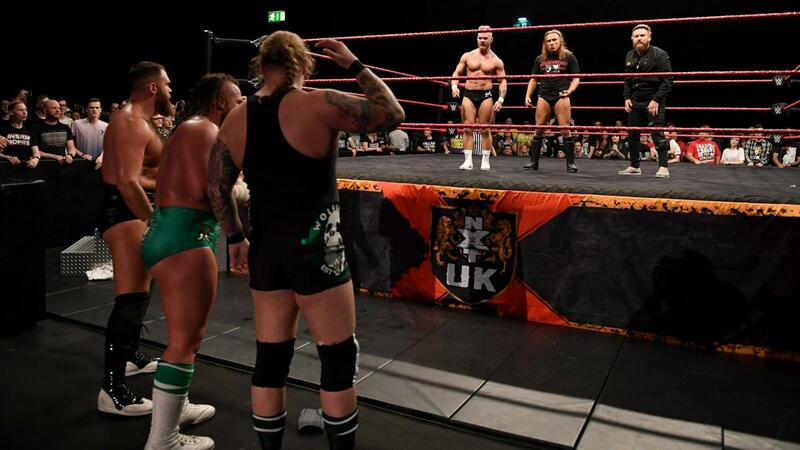 Joe Coffey was scheduled to face ultimate UK underdog Sid Scala for this match, so his overconfidence made him send his brother Mark and ally Wolfgang to the back. It's just Sid Scala, after all, and he's Joe Coffey. Plot twist! Scala revealed he was not medically cleared to compete this week and then went on to reveal his replacement: Moustache Mountain's own and the first-ever United Kingdom Champion, Tyler Bate. 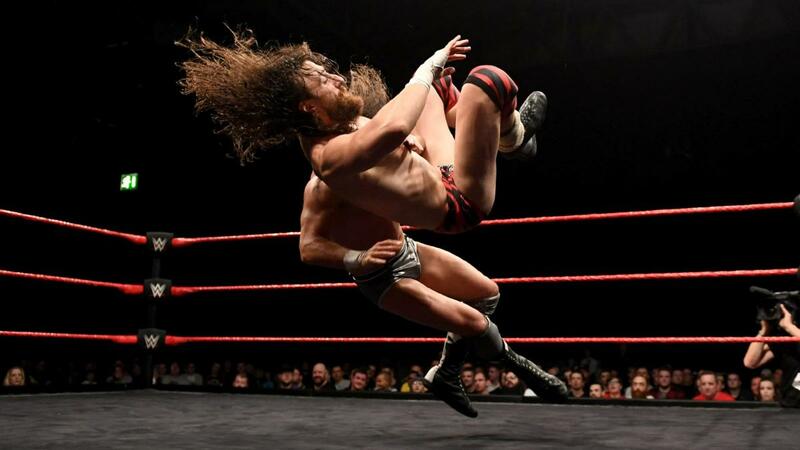 If you forgot, two weeks ago (at least for us), the Coffey Brothers and Wolfgang destroyed Moustache Mountain after Trent Seven's main event match with Zack Gibson. Bate clearly had vengeance in mind when he went toe-to-toe, fist-to-fist, with the massive Joe. It was only a matter of time before Mark Coffey and Wolfgang came back to ringside to make sure they had the numbers advantage should they need to. Bate looked like he was about to win with that Tyler Driver '97 but Mark and Wolfgang caused a distraction, prompting the other half of Moustache Mountain to walk down the ramp. What took you so long, Trent? Oh, right, he was probably combing that impressive moustache. Moustache care is important, boys! Of course, since the Coffeys and Wolfgang still had the numbers advantage, Moustache Mountain fell prey to another attack. Just when Bate had the win again, the Last Kingdom of Scotland—not their real name—assaulted him, causing a disqualification and my prediction to come true: United Kingdom Champion Pete Dunne ran out to make the save and it looks like we have the British Strong Style versus Coffeys and Wolfgang feud I won't shut up about. I am all for this. Sure, the match between Joe Coffey and Tyler Bate could have gone a different way without drawing the disqualification, but the Coffeys and Wolfgang are supposed to be a pack of savage predators. They're not going to care about how matches end, only who stands tall. 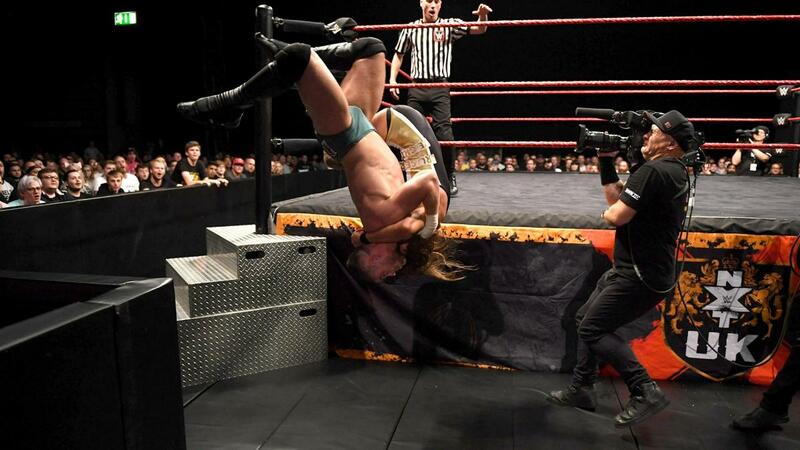 The main event of part one of this week's NXT UK edition had United Kingdom Champion Pete Dunne defend against Finn Bálor's protege, the so-called Import Killer, Jordan Devlin. Devlin challenged Dunne last week (to us, anyway) after beating the luchador out of Ligero. Say what you will about Dunne and his title reign but he never disappoints in the ring. I knew he'd come out of this still the United Kingdom Champion but this match made me reconsider my very existence. Devlin genuinely looked like he was going to win at one point, which was very confusing. Dunne's main schtick is his obsessive, almost psychotic affinity towards breaking his opponents' fingers. That's what makes him very unique. Devlin's main schtick is— Huxley Christ! Those Spanish Flies from Devlin were amazing. That one in the ring was great but the other one off the steel steps? He really brought it to Dunne. The almost count-out conclusion made for great drama as did Dunne failing to cover Devlin after a Bitter End because of his injured back. A third Spanish Fly from the top rope followed by a moonsault was a beautiful combination. Unfortunately, Devlin moonsaulted his way into a submission loss. Nevertheless, the story was great, the match was great, so this was a great main event that you should definitely not miss. 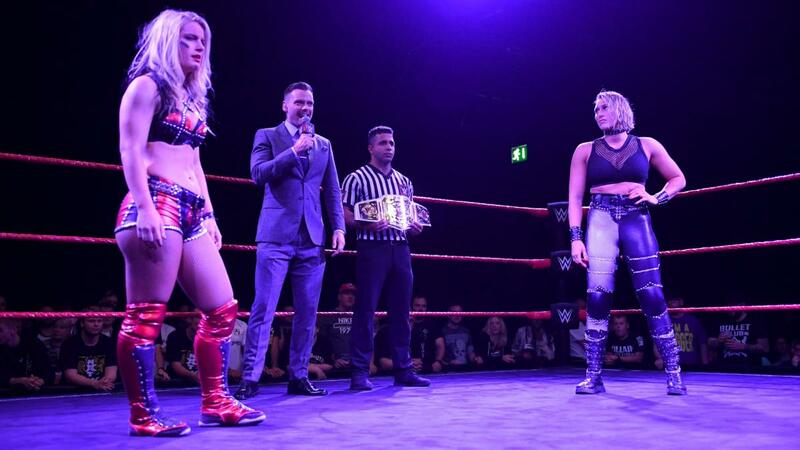 Speaking of great main events you should not miss, Rhea Ripley and Toni Storm duked it out to determine who becomes the inaugural NXT UK Women's Champion. I was surprised NXT UK decided to go with two Australians instead of at least having one UK-born competitor—you did your best, Jinny, but you are evil—in the finals match, but ask any UK fan and they'll most likely consider these two, if not mostly Toni, their own flesh and blood. Storm, after all, made her career in the UK a memorable one and continues to do so. That is, if she can survive Ripley. Huxley Christ, Rhea just threw Toni into the barricade and against the ring apron! What madness! Storm was on the defensive until she managed to hit not just one but three suplexes to Rhea. I love how the 2018 Mae Young Classic Winner took into account her back, failing to hit her Storm Zero finisher because her back gave way due to Rhea intelligently pinpointing it earlier in the match. Rhea capitalized on that flaw and hit her Riptide finisher—great name, by the way—to get the win and the championship to boot. That was just cerebral, and I'm not just talking about Triple H coming out with NXT UK GM Johnny Saint to congratulate the first-ever NXT UK Women's Champion. Aussie, aussie, aussie! Oy, oy, oy! This was an amazing main event with a great story and great stakes and an even greater development. A lot of us probably already knew Ripley was winning this match. After all, she has been champion for around 90 days now. Yet the action and the crowd reaction—boy, were they stunned—were enough to let that tiny detail slide. All in all, this match is a wonderful conclusion to the tournament and an exciting start to the women's division's future. With Ripley leading the division, plus Toni Storm and Kingslayer Slayer Dakota Kai among others, the future of the NXT UK's women's roster is bright. FINAL DECREE: This week's NXT UK was stacked with storyline developments: Saxon Huxley and Joseph Conners came to blows after their tag team imploded, British Strong Style has had enough of the Coffey Brothers and Wolfgang, Jordan Devlin almost took the crown off Pete Dunne's head, and we now have an NXT UK Women's Champion in Rhea Ripley. Plus, that whole thing with Zack Gibson and James Drake actually led to a formalized partnership, which is technically debatable in its worth. With all that and more, NXT UK continues to earn itself an A from Xia Brookside's bae. I'm talking about me. She doesn't know that yet and probably never will. No one snitch on me please. Perhaps the two youngest members of the NXT UK women's division, my rainbow cotton candy princess Xia Brookside and "Suplex" Millie McKenzie teamed up against the NXT UK debutante Charlie Morgan and the ever-dangerous Killer Kelly in a fun tag team match. Morgan was able to show off her stuff while Kelly played nasty predator with that vicious turnbuckle slam. This was the young guns' win, though, with Xia taking advantage with a pin on Morgan after McKenzie speared the living hell out of her. Xia and "Suplex" Millie make for a pretty great tag team with their stark contrast in aesthetics as well as styles. Eddie Dennis is tall. Ashton Smith is athletic. I always have fun watching Smith "whoop" all over the place during his matches. Alas, this was Dennis' victory as he continues his winning ways before probably dropping his "friends" Mark Andrews and United Kingdom Champion Pete Dunne when they least expect it. To say that Dennis is interesting would be an understatement. Okay, so maybe the Ligero versus Dan Moloney match doesn't have a storyline yet but we'll get there. Probably. Moloney kicking out of Ligero's Sliced Bread made me think that a quick study with The Brian Kendrick could help the British luchador. Eventually, Ligero picked up the win with his springboard DDT. This was a good match. Not a lot to talk about yet. Both men are dependable members of the locker room, so we'll inevitably have them getting inserted into storylines and what-not. A new (in NXT UK, anyway) tag team was born after James Drake helped Zack Gibson secure a singles win against Trent Seven, and it looks like they'll be teaming up for a while. Their first victims? Amir Jordan and Kenny Williams. We've seen Jordan and Williams tag before. Both men are fun to watch and it was no different here. Although it's a logical concern that Gibson, a very entertaining singles star and perhaps one of the best heels of his generation, may feature less prominently because of this tag team run with fellow young and grizzled veteran Drake, I'm certain that won't be the case. The fans will continue to loathe Gibson whether he's in singles or tag team competition anyway—someone buy me a shoe so I can take it off whenever Gibson's on—and I wholeheartedly believe that Gibson and Drake will reach great heights together. Jofer Serapio (@ShawarmaJoe) reviews WWE RAW & NXT UK for Smark Henry. He has been an avid professional wrestling fan since grade school. These reviews are as close to professional wrestling as he can get. Xia Brookside is his bae (no one tell her).